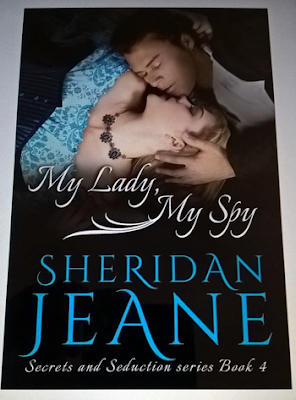 My Lady, My Spy by Sheridan Jeane is the fourth book in Secrets and Seduction series. When I heard about the book from the author, Sheridan Jeane, I was instantly intrigued. A big fan of spy stories, this one had all the makings of a book that wold interest me. However, before beginning with this book, I took the author's advise and read the book previous to this one named Once Upon A Spy first because My Lady, My Spy happens at the same time as the previous one and the stories overlap but is told from the POV of different people. So to understand the story and the characters better it is better to read these two books in order even if you haven't read the first and the second books in this series like me. My Lady, My Spy narrates the story of Frederick who is a spy for England and on a mission to steal a book from the Russian Embassy which contains sensitive information that can avert a war between Russia and England that seems inevitable at the moment. However, he gets burned and has to improvise which also leads him to be caught in a lie to Lady Harrington with whom he spent a few passionate nights together and has tender feelings for but with whom he can never have a future due to a dangerous secret from his past. Josephine Harrington is fed up with his mixed signals and determined to know what his true feelings towards her are. Frederick can never tell Josephine that he is a spy nor can he make a life with her without giving away that one secret that he has guarded all his life but neither can he leave her alone and move on. What will Frederick do? Will Josephine who has already lost a husband find her true love in him or is she destined to remain alone and without love? Just like the previous book, Once Upon A Spy, I enjoyed reading My Lady, My Spy by Sheridan Jeane and was happy to delve into Frederick and Josephine's story. These two characters had intrigued me in the previous book and I was eager to see how they would go around working out their feelings for each other. Frederick is a complex, mysterious and closed character who doesn't share his feelings with anyone. He is the perfect spy, easily adapting to any situation and ready to improvise to accomplish his missions. His only weakness is Josephine, a woman who has his heart in a fix and his feelings a mess. He can neither leave her nor embrace her in his life. Josephine is a beautiful, strong and intelligent woman. She is the perfect match to Frederick's deviousness. She saw through his facades easily and knows him a little too much for his comfort. I enjoyed watching Josephine graciously glide in Frederick's life and him fumbling to understand how to deal with her! The story in this book takes place at the same time as the one in Once Upon A Spy and I loved meeting Frederick's brother, Robert and Antonia again. The mystery in the story and the mission of retrieving the book amidst lots of danger, suspense, adventure and romance continues in this book and had me feeling like I was watching the next episode of an ongoing story. Sheridan Jeane's writing style is fluid and expressive. She created the Victorian era flawlessly where there were spies working for the Crown, there were beautiful ladies in elegant gowns, glittering and pompous balls and the whole English scene of that time was so realistically sketched that it felt like I was there. I enjoyed her characterization and could relate to the various characters in this book. The characters are real people with relatable problems who soon made a place in my heart and I sat engrossed in their daily trials and tribulations. The suspense, thrill, adventure, romance and emotional play is beautifully balanced and the author keeps one step ahead throughout with giving us well calculated twists and turns. I enjoyed the story and was hooked right till the end. Now after having finished this book, I look forward to reading the previous books in this series soon. All in all, My Lady, My Spy is an engaging and entertaining historical romance with plenty of adventure, suspense, thrill and drama to keep you hooked throughout. 4 out of 5 to it and recommended to all historical romance and suspense lovers. I look forward to reading lots more from the author in the future.